Since several readers plan a visit to Québec*, I'll summarize the three-day getaway spent there last week: touristy, tasty and terribly cold. 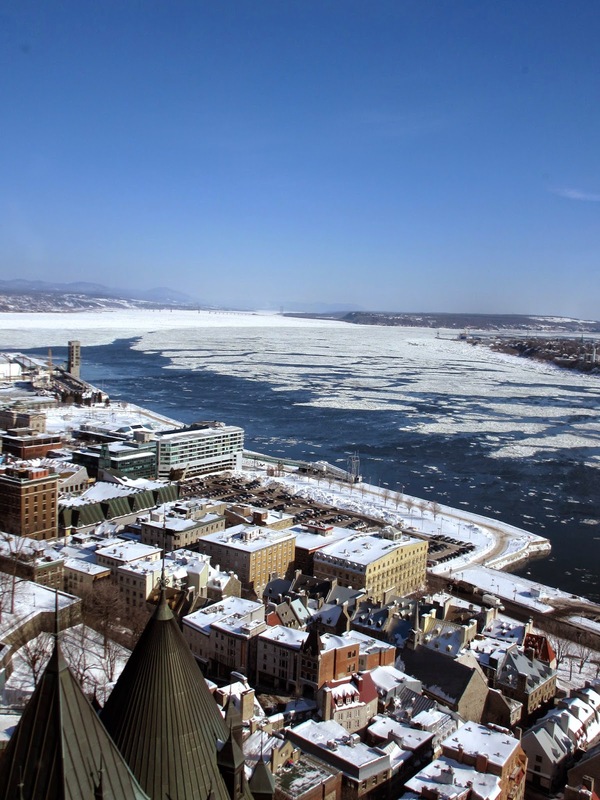 One of the oldest cities in North America (founded in 1608), with its historic lanes and walls carefully preserved, Québec is also the capital of the province. A Lonely Planet entry summarizes its allure. Le Duc chose the site for his birthday dinner, Le Pied Bleu, a bountiful and boisterous intersection of deeply local dining and happy anarchy, in the spirit of a Lyonnaise bouchon. We were seated in a butcher shop doubling as a top-notch bistro, run by rambunctious crew who see no reason for propriety, from either side. I sampled five salads, brought to the table to serve myself, à volonté—followed by stewed rabbit; Le Duc had a charcuterie platter (everything made on site, we ate in the shop), and boudin noir. Here's the birthday boy; he isn't drinking all those digestifs, but the shot shows how they are served: a hamper dropped at your table with a couple of glasses. The cheque totaled... um, can't remember, except I thought it was fine. It's not in prime tourista stretch, though only a 10-minute cab from the hotel. The city's amusements extend from museums to music to macarons, but we were there to be together. Le Duc bought a pair of shoes. I have never seen so much good-looking, functional deep-winter wear offered anywhere; this must be the Serious Boot capital of the world. In Québec, I was reminded that Montréalers do not exactly own the cred for being people of the farthest North. In a restaurant, a table of three Inuit men conversed intently in Inuktitut (the term for the many variants of Canadian Inuit dialects). My ear was tantalized by a language that existed here even before Samuel Champlain founded New France. Frigid, crystalline air, the sparkling river, the palpable pride of the hotel's staff, the exuberant local cuisine: celebration, nostalgia, romance. The icing on the cake for Le Duc was the unimpeded sighting of a fisher in a snowy field, viewed from the train window. And we agree we would travel there just to dine again at Le Pied Bleu! *In Canada, the proper name of the city is, in both French and English, Québec, and in informal English, Quebec City (without the accent). Like New York/New York City, the short form is more common. Québec is pronounced "kay-bec" with the stress on the second syllable. You just put Quebec much higher up on my list of future destinations! And your husband is very handsome - although having admired your allure for many years, I'm not at all surprised! I haven't been to Quebec in years! Thanks for the reminders of how wonderful it is. It sounds wonderful! We'd love le pied bleu, I think. Le Duc looks so happy to be there, what a wonderful 60th. And a turret!!! I've always wanted one, hope you enjoyed yours. Your descriptions make me want to travel to Quebec! I think I'll wait until summer. Québec is such a beautiful city! I spent a month at the Collège Merici one summer. Your husband looks as though he is enjoying his birthday. It looks very cold! I'm swooning over the hotel and your adventures of course, but swooning even more over your beautiful writing (always excellent, but over-the-top excellent in this piece). Thank you. 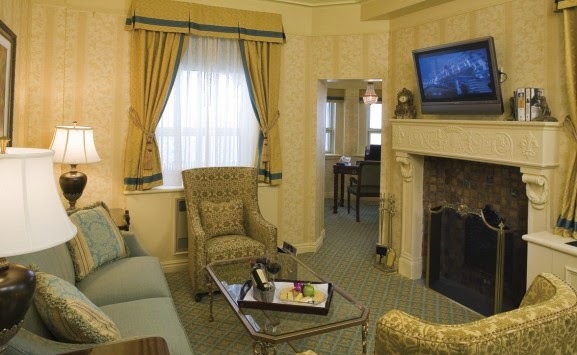 The hotel looks luxurious and to think you had a whole suite to yourselves....lovely. The dinner sounds wonderful and Le Duc looks quite happy. You both know how to celebrate in style, one for the memory books I'd say. Happy birthday to Mr. Handsome, and so glad you had a grand time! Wow, what a view form your gorgeous room - you must have been torn, whether to spend your time at the window looking out, or cozily ensconced in an armchair! Looking forward to hearing more about it, and continuing the celebration! Such a wonderful post! Hello Le Duc and bonne anniversaire à vous! You had me at 'turret' ... And then the food. 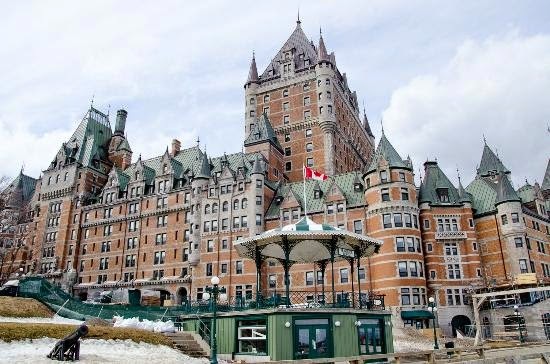 Canada is definitely on our list of places to go if we ever pay off the mortgage/get rid of the teenagers, and I will make sure Quebec is one of our destinations! Perhaps not in winter, however, as we're not accustomed to quite that type of cold. 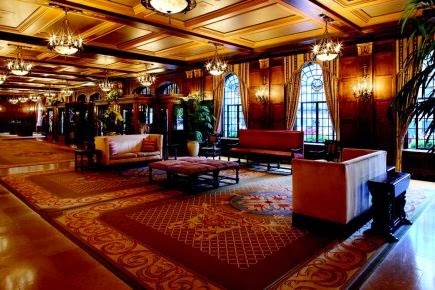 You've brought back wonderful memories of a stay my husband and I had at the Frontenac some years ago. We had amazing meals at the local restaurants as well. Thanks for the memories and I am happy that you both had such a an enjoyable visit. Indeed, the writing in this piece is splendid, and we remember that the First Peoples have been here for millennia before the founding of the French settlement. Like the English in New England, the French would never have survived here without the knowledge and survival skills of the Indigenous peoples. In milder weather, Le Pied bleu would be an invigorating walk back up to le Château, but I'd certainly have taken a taxi as well in the bitter cold. I was sure they'd have taken the train: it is a splendid journey. In the autumn, many Asian people come here to do it as the leaves turn. At first, mostly Japanese, but now there are Chinese tourists who can afford the trip, as well as Koreans and Southeast Asians. On my one visit to Quebec I bought a suede and fur hat, it is beautiful, but I really needed a hat. It was frigid. We did love the sights and walking even if my feet were numb from the cold. I am from Michigan and know how to dress in the winter but that year Quebec almost froze me out. fcmcg: I'm from Michigan too- but Québec is considerably farther north and I'm a lot older than in the days when I spent all day outdoors in Petoskey! The Inuit fellows were in cotton, short sleeved shirts: "Cold? Not particularly." Another Michigander here; but I've lived in Texas for 25+ years, so my blood is thoroughly thinned! But your getaway looks wonderful. I've only been to Windsor and Niagara Falls in Canada. Montreal is on my travel wish list, and now I will need to add Quebec as well. In the summer, maybe, though. And Le Duc is adorable! My hubs will also be turning 60, later this year. I need to step up my celebratory plans! 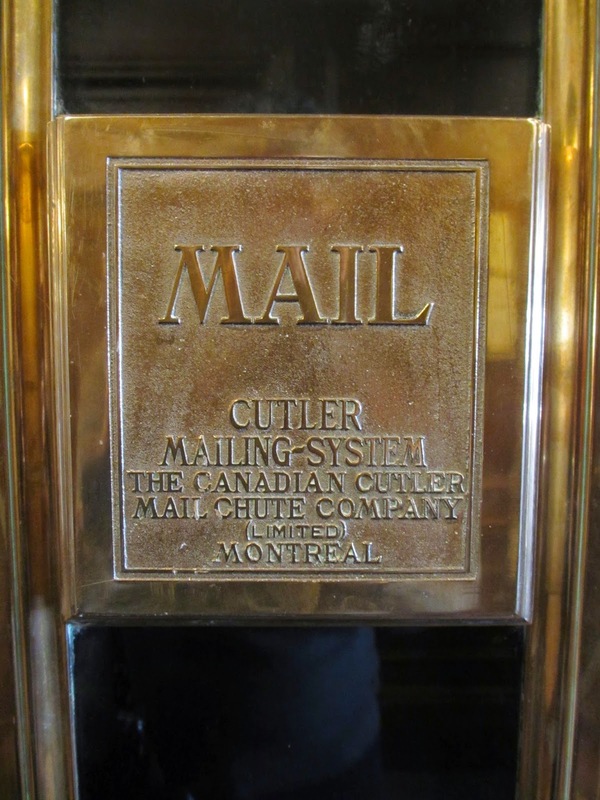 I used a mail slot like that back when I was in college. I wondered why the addressee never responded. Thirty something years later when the building was being remodeled, they found my letter and returned it to me. Oh my goodness, that looks aMAZing! What a wonderful way to celebrate. Right, now Quebec is on my list too... problem is, Canada is tricky to get to from Bristol. I'd have to get to London and do various internal flights, I think. Do-able, but a bit of a faff and a fairly serious investment, I think. Eleanorjane: There are many flights from London to Québec, direct but not non-stop. (They usually stop in New York and sometimes Chicago.) There are nonstop flights to Montréal, and from here it's an easy, scenic 2.5 hour train or drive. Anonymous: I've heard similar stories. That's one of the hazards of those chutes. Sometimes they are opened and vacuum swept because of that tendency.